Windshield replacement is a critical fix for your vehicle because the windshield is an integral part of the vehicle safety systems. Performing a windshield replacement by the book, by a certified shop and technicians will ensure that your vehicle can protect your life. 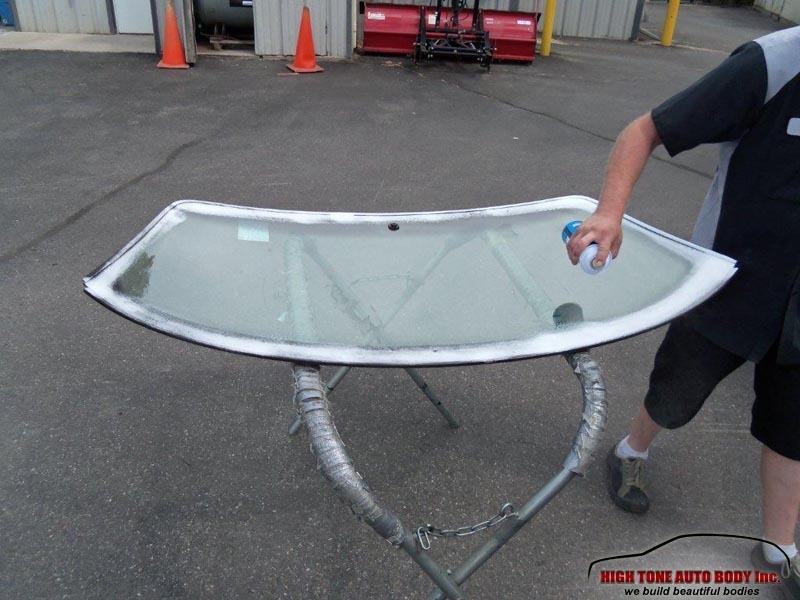 Here at High Tone Auto Body we take windshield replacement services very seriously and follow the industry standards. Driving down our Colorado roads is fun with all the beautiful scenery, but our roads hide a big hazard to our vehicles’ windshields. opt for a windshield replacement. In either case, you want a professional to do the repair/replacement. 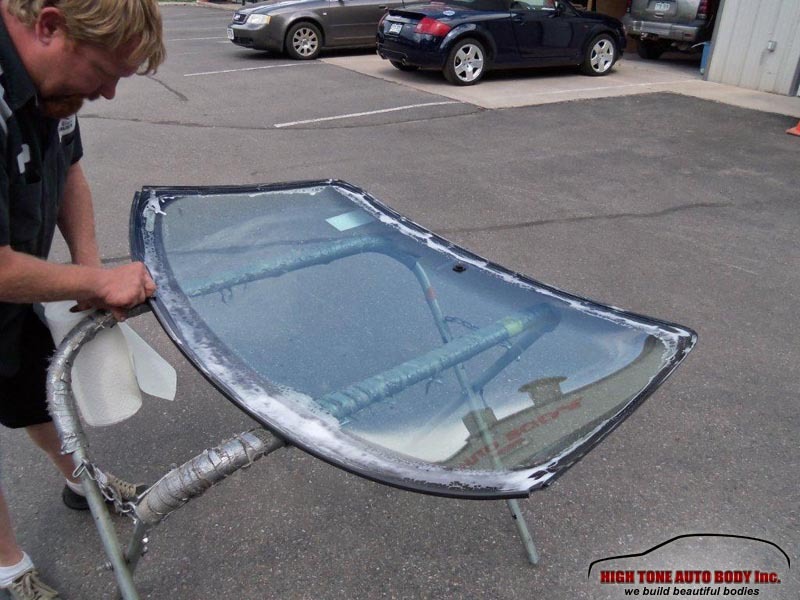 Windshield repair with various dent removal techniques is not a critical job and there are even DIY kits on the market with simple instructions to follow. 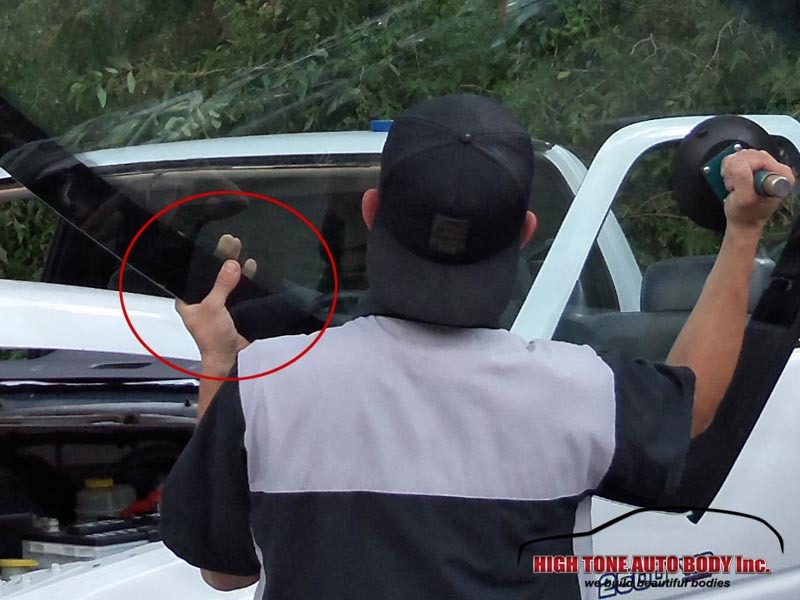 For small dents this is a solid option. But if the windshield damage is larger than 5 inches (length of a dollar bill) the windshield is due for replacement because this fracture may severely influence the windshield’s ability to handle mechanical loads. 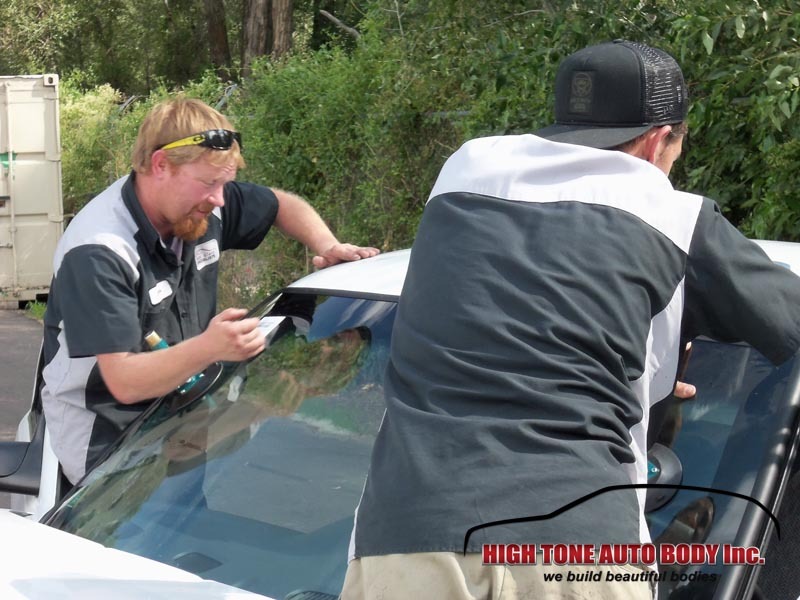 However, windshield replacement is categorically different because this process is actually altering the vehicle’s mechanical rigidity and therefore, altering it’s potential to act as a shield for your life on the road. 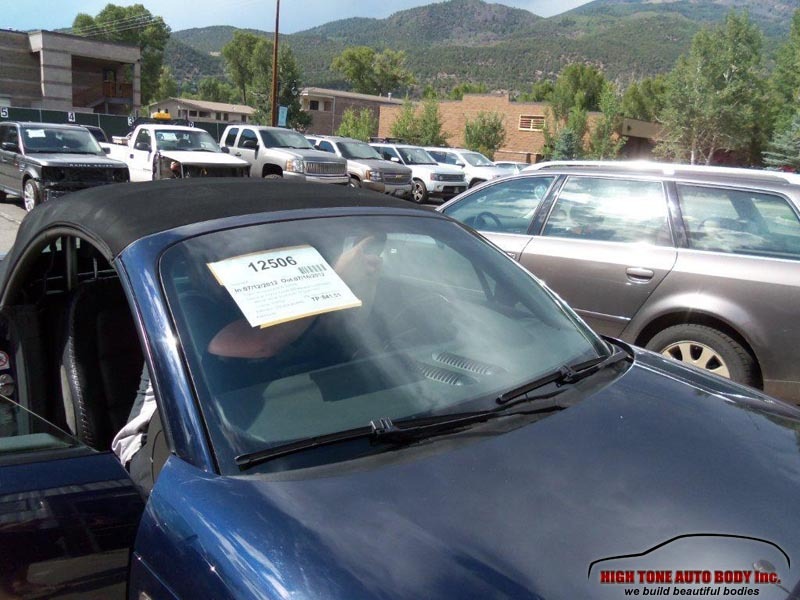 The windshield is responsible for almost 20% of the vehicle’s structural integrity. 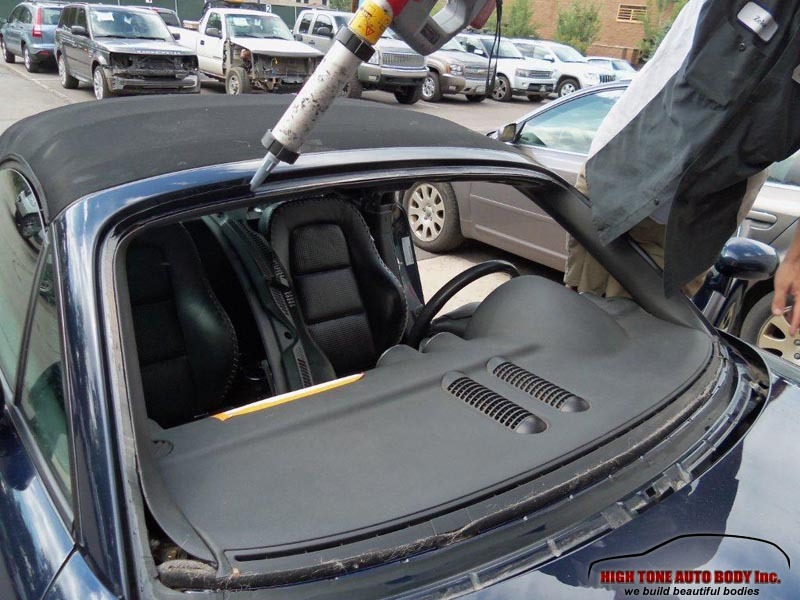 It is an integral part of the car body and is the key factor that keeps roofs from buckling during car accidents. 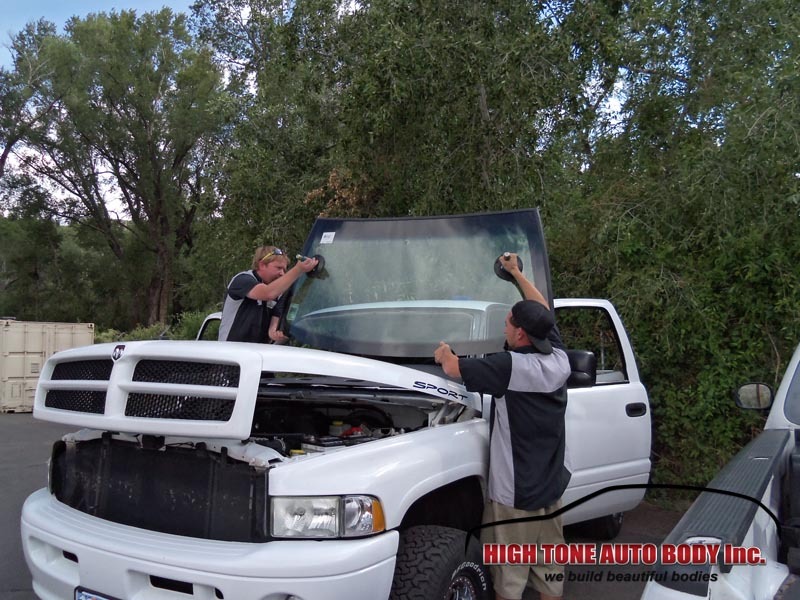 Here is a perfect case-study of proper windshield replacement service and we take pride in this because not many repair shops in the Basalt-Aspen area take such good care. 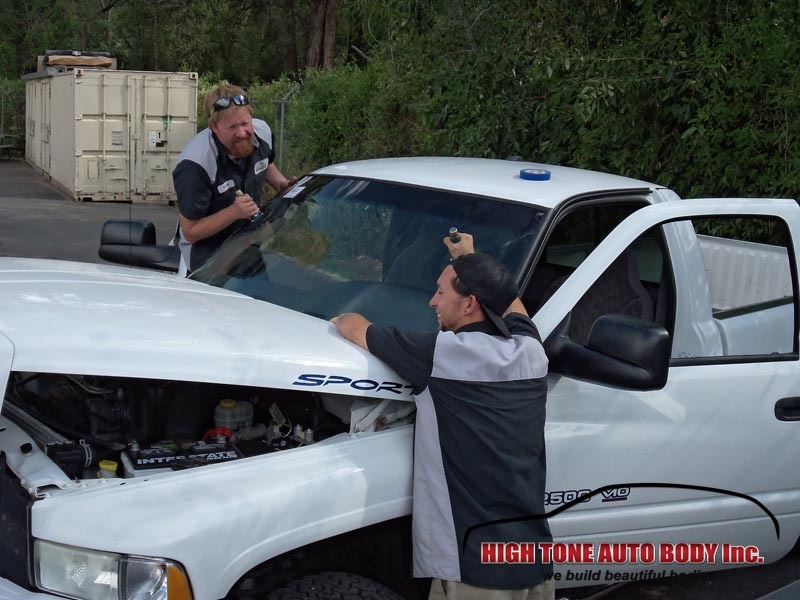 A client drove in with a pickup truck with a cracked windshield that was too damaged to be repaired and the only option was a windshield replacement service. 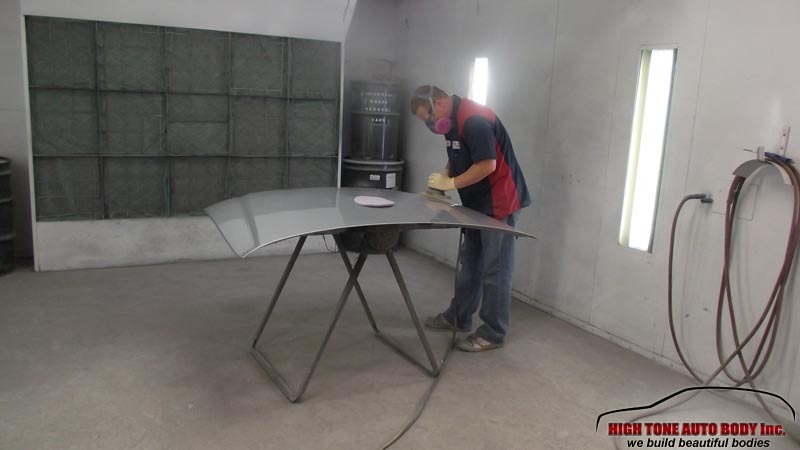 Our technician told the client to come back the next day because proper windshield replacement means leaving the vehicle still for about 10 hours, giving enough time for the glue to chemically react with the primer and stiffen properly. secure the windshield in its position and leave the adhesive to cure for at least 10 hours before vehicle can be driven off. Positioning the windshield is a crucial step. 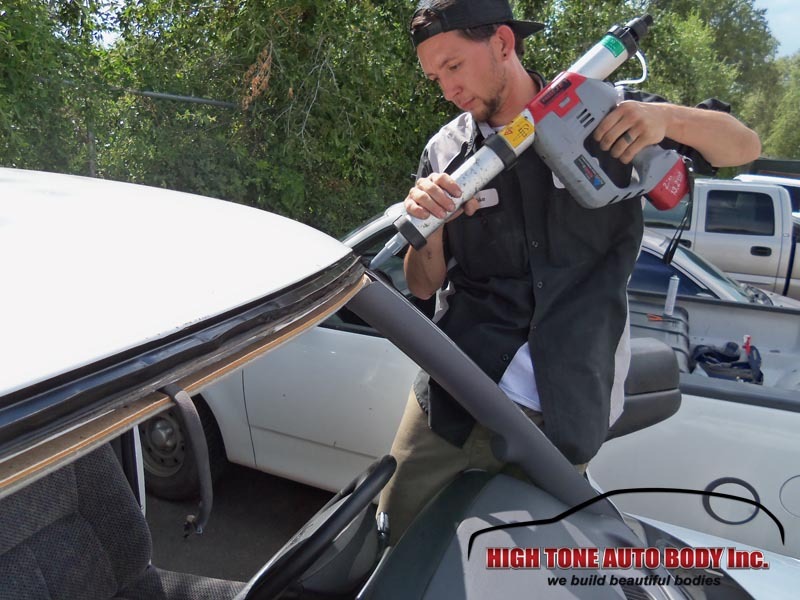 Trained and certified technicians know that they must not touch the windshield’s inner side where it will be in contact with the glue. 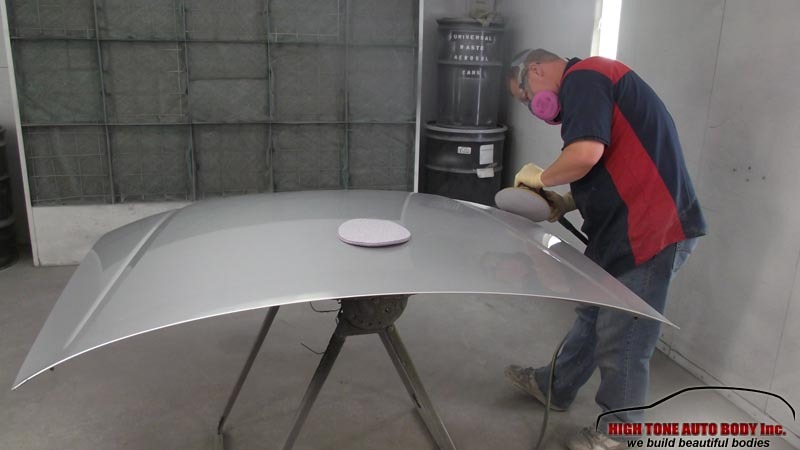 Any dirt, dew or other surface contaminants will compromise the integrity of the glue healing process which will in turn compromise the windshield’s ability to properly adhere to the car body. 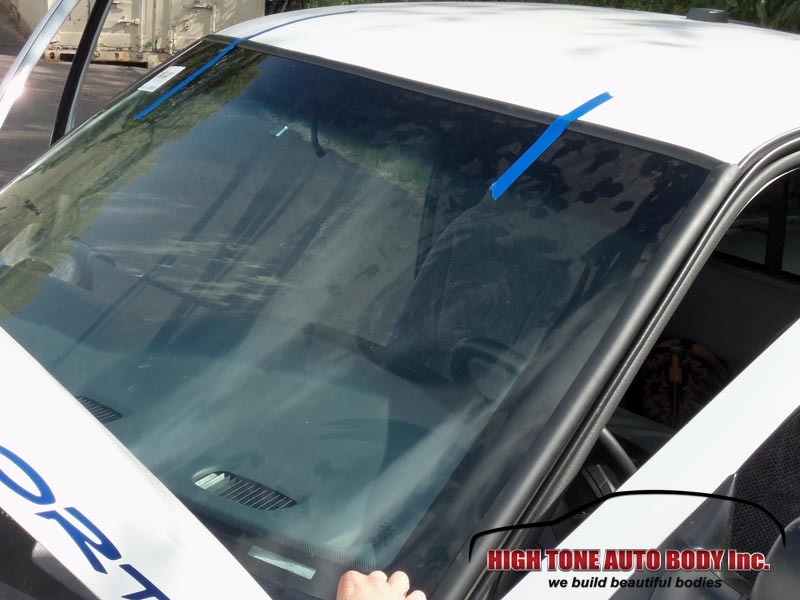 Once the windshield was properly positioned and secured technicians left the vehicle to sit for at least 10 hours before it was released to the client. As winter approaches, with all the snow and rain, it gets quite difficult to avoid car collision situations, especially here in Colorado. With all the snow we get in the Basalt-Aspen area, car crashes are quite common. 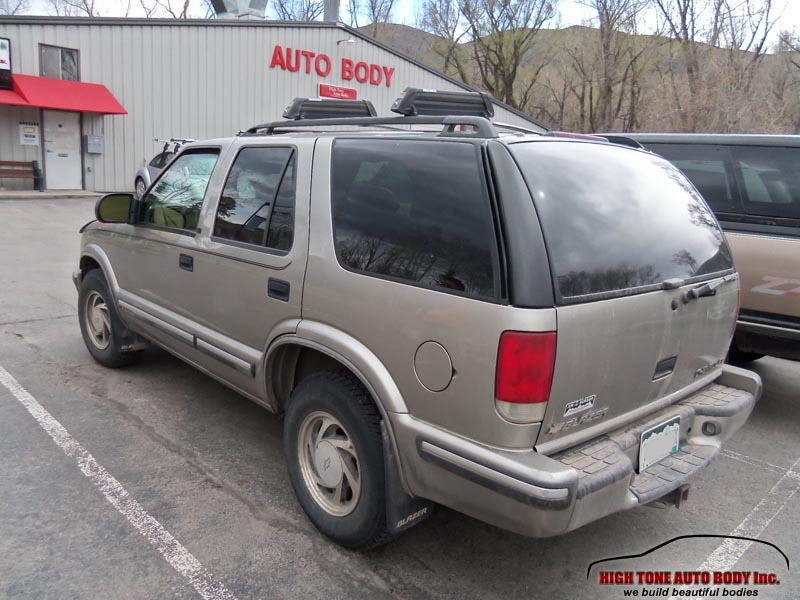 High Tone Auto Body is the friendliest and most reliable collision repair shop in the Aspen-Basalt area. We’re a family-owned business for over 31 years now. 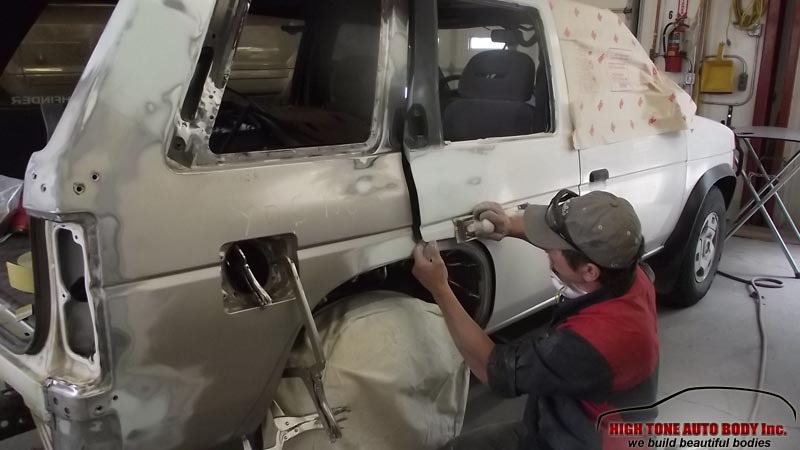 While many repair shops can handle an auto body repair of a crashed vehicle, very few nowadays dedicate the full, needed attention to properly restore a crashed car to it’s pre-crash condition. Safety regulations are quite precise, and your safety on the road is extremely important. 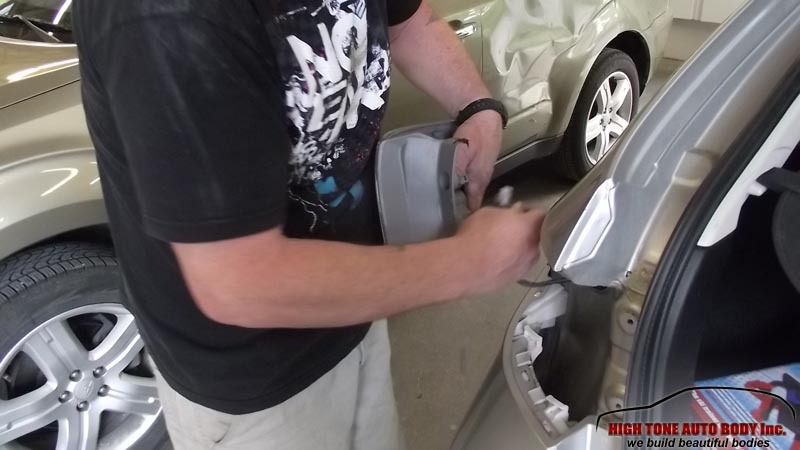 Doing a proper collision repair takes skills, equipment, and most importantly, attention to detail. Unfortunately, it gets more and more difficult to find a repair shop that will dedicate all the needed attention that is needed for a proper repair of a crashed car. 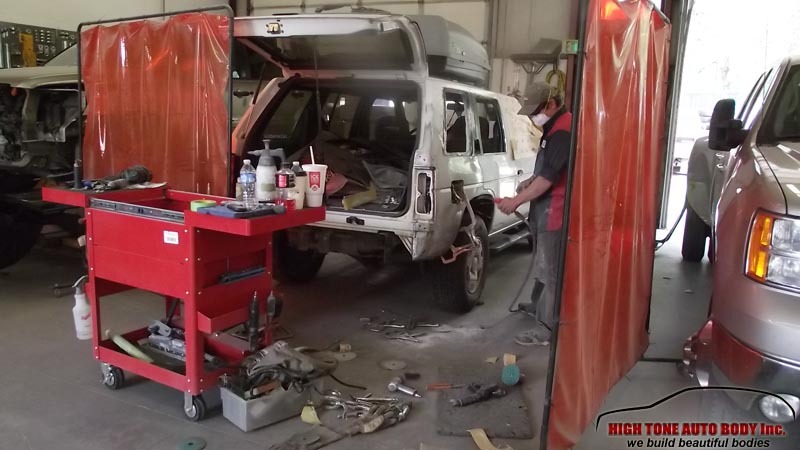 High Tone Auto Body Inc. is a family owned repair shop for over 31 years, and we take your safety on the road very seriously. 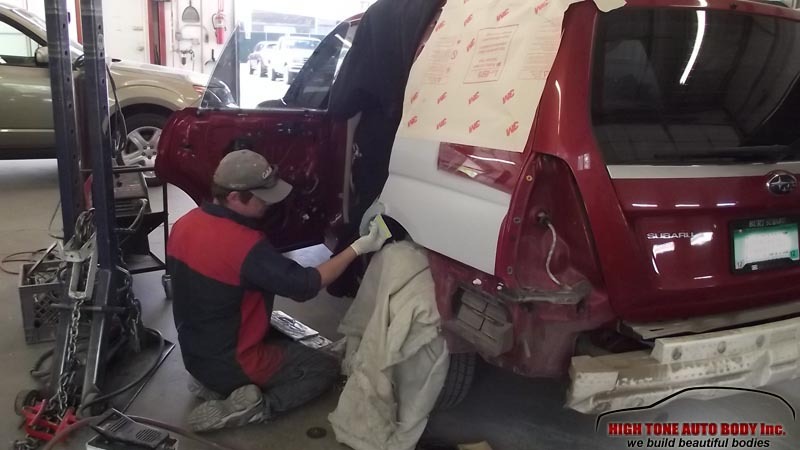 Our auto body repair technicians are certified and between them, have decades of hands-on collision repair experience. 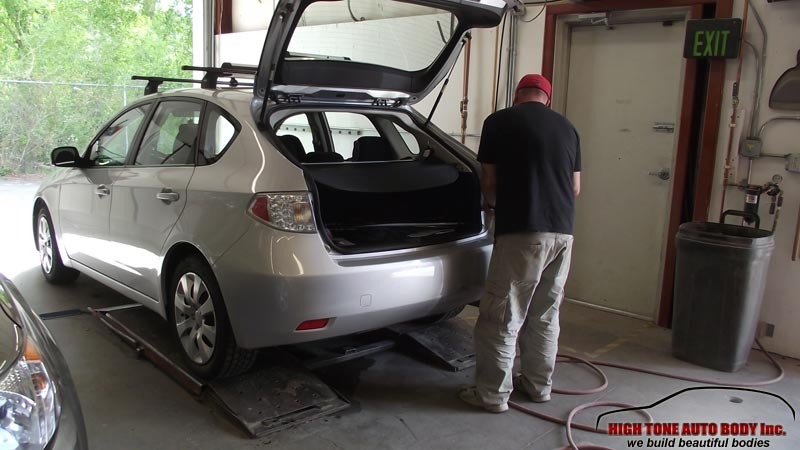 Thanks to our extensive experience and top-of-the-line car repair training, you can rest assured that you will get the best collision repair in the Aspen-Basalt area. If you had a car accident, regardless if the car only needs a minor bumper repair, or a full body repair after car accident, you can rely on our repair services with your vehicle. You can also rely on us to get help with car crash insurance claims. 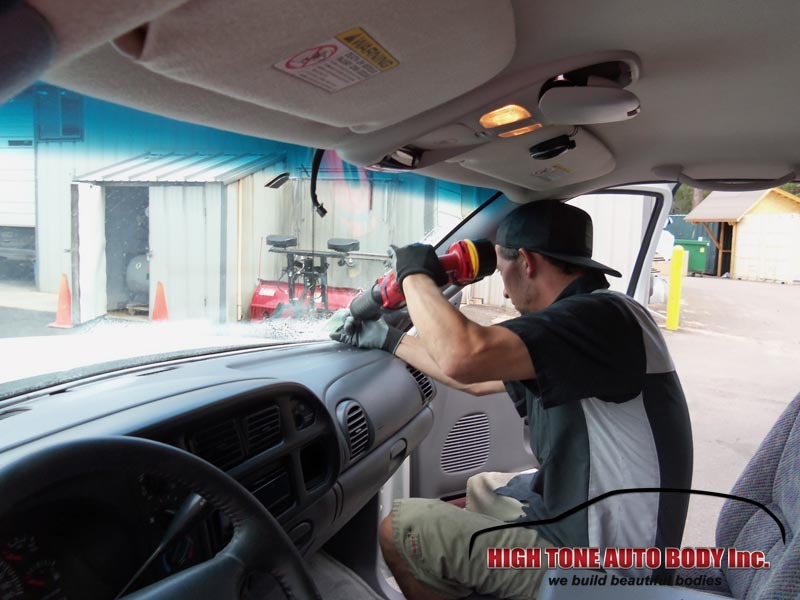 Replacing windshields is a standardized servicing procedure and is regulated by several certification agencies in the US. But many car repair shops cut corners hard-pressed to service more clients and raise profitability. Here’s a short list of things to ask the repair technicians before you entrust your vehicle for windshield replacement. 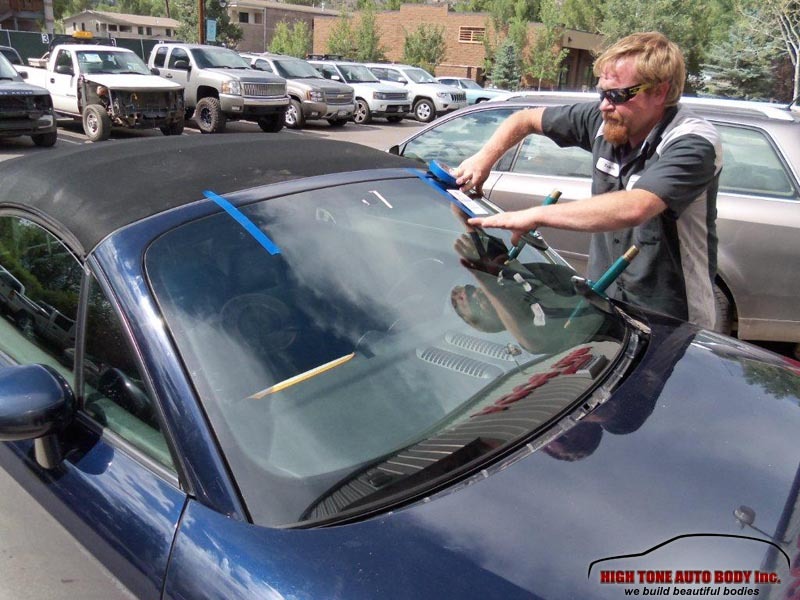 Are You A Certified Windshield Replacement Technician? 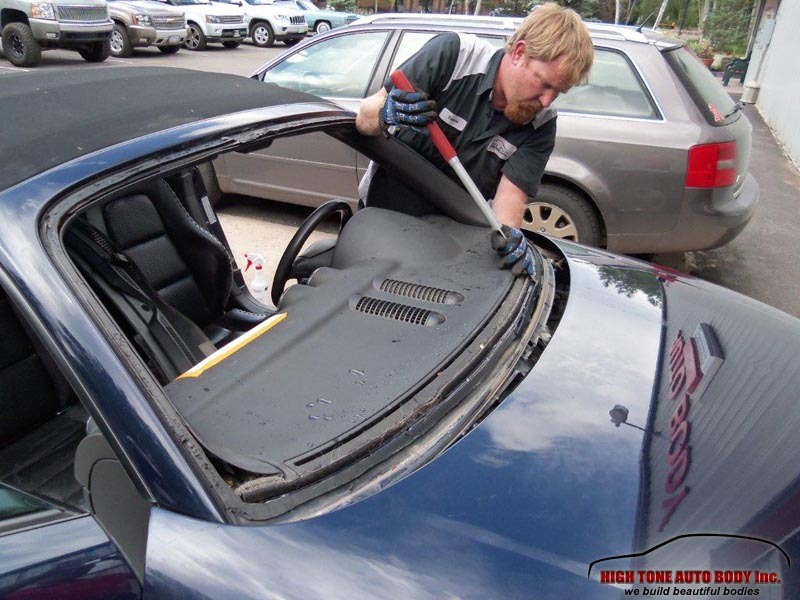 There are about 11 million windshield replacement procedures in USA every year. 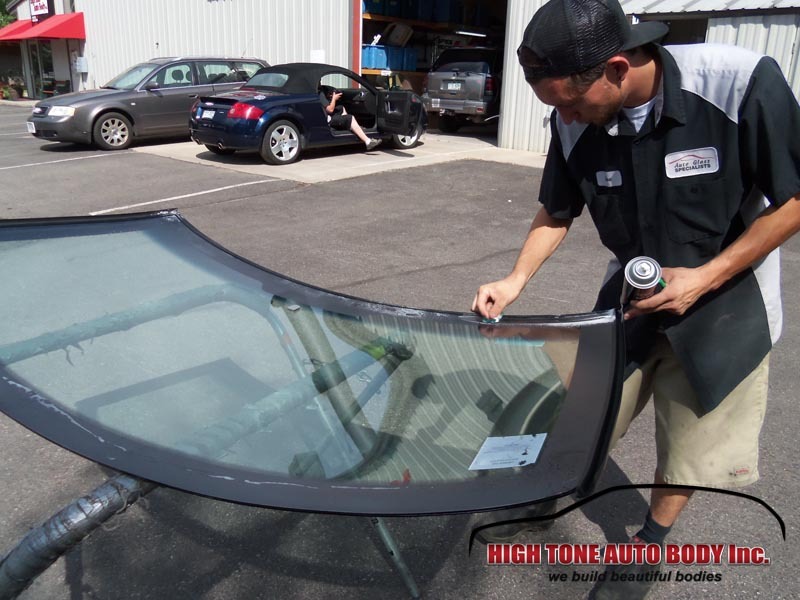 But very few of these replacement jobs are done properly and by certified windshield replacement technicians. As the windshield is responsible for about 20% of the vehicle’s structural integrity, cutting corners or doing a sub-standard windshield replacement job is a serious safety hazard. Proper windshield installment is crucial for reliable airbag functionality because when the airbag goes off, it needs a solid windshield to bounce off and absorb the passenger’s body impact. 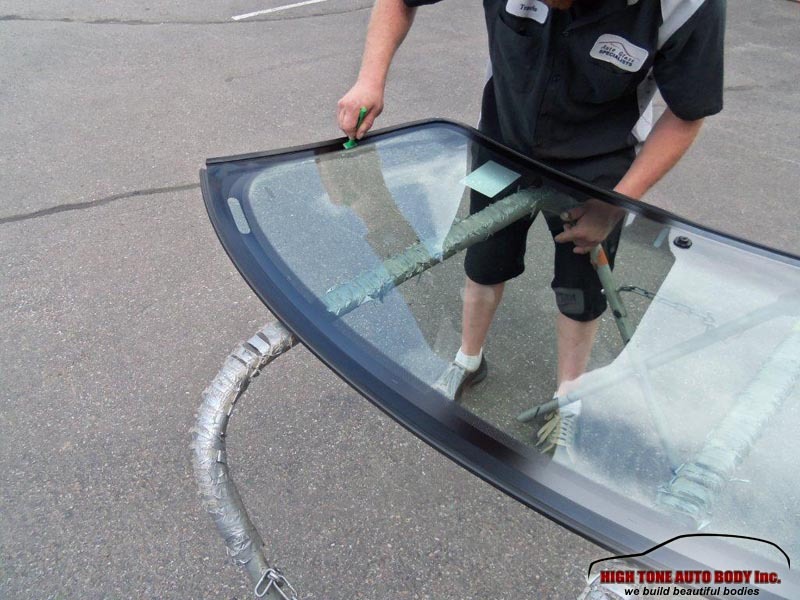 Certified windshield replacement technicians know the proper installment procedure as well as all the preparatory steps prior to installing the new windshield. 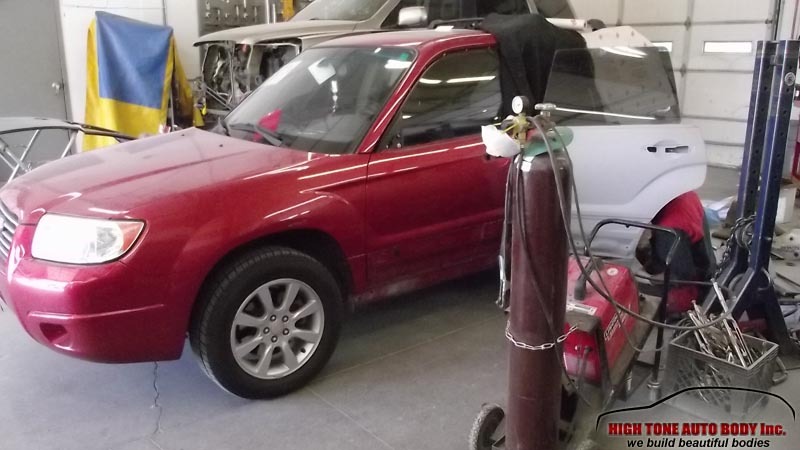 If the repair technician does not follow through all the required preparatory steps the vehicle will have a severely reduced potential to keep passenger safe inside the passenger compartment. 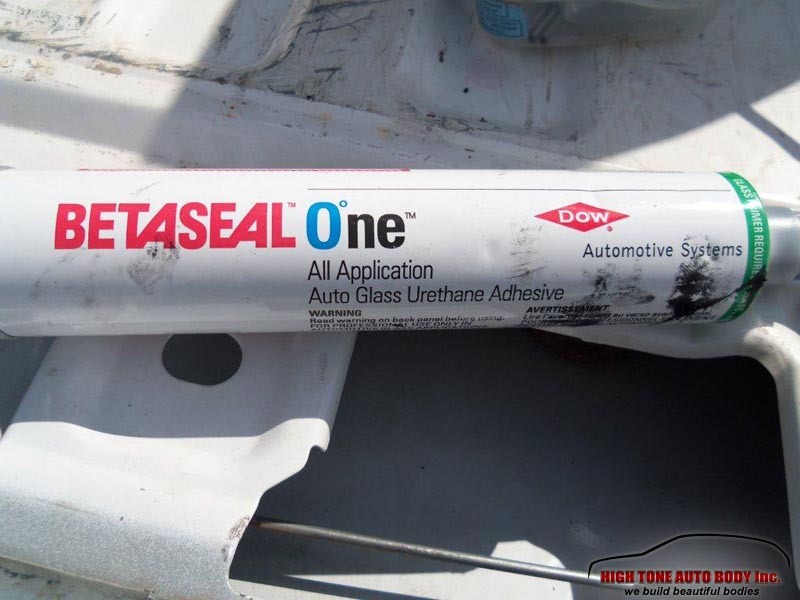 Do You Use All The Right Adhesion Materials? These three chemical solvents are extremely important and their proper use insures strong adhesion between the new windshield and the auto body. 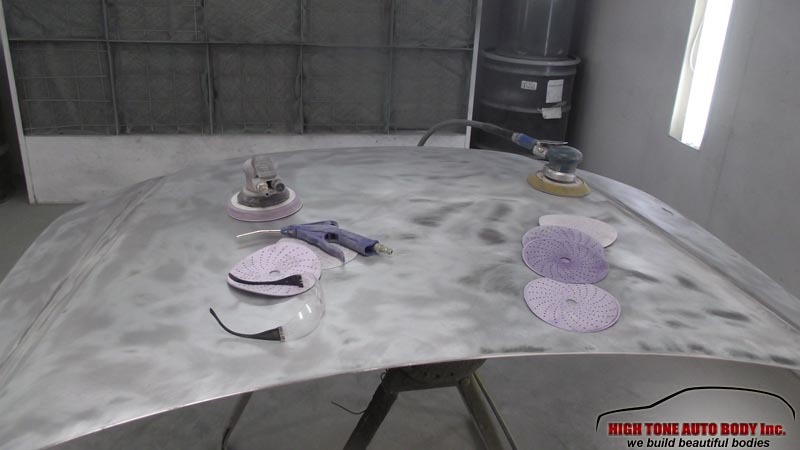 If the repair technician tries to convince you that there’s no need of a glass cleaner/degreaser, or that the urethane glue is enough in itself and there’s no need to use a primer coat, walk away from the shop. Properly installed windshield is your guardian on the road, and you don’t want it installed unprofessionally. 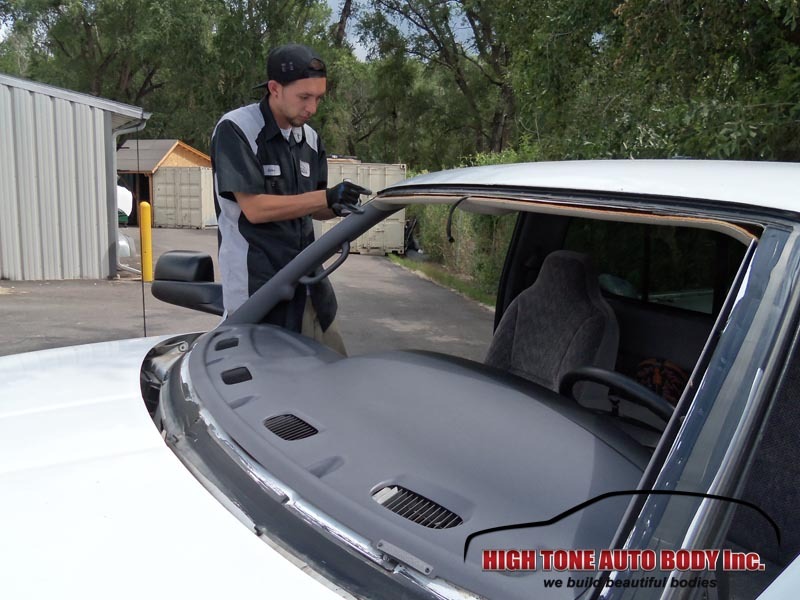 At High Tone Auto Body we take great care to use the right toolset and the right procedures to ensure proper windshield replacement so that your vehicle will be structurally sound and keep you safe on the road.